Hillary and The Donald are 19th Cousins? Yawn. Let's just say, even if true, this isn't very surprising. I am happier about the relationship with certain individuals above than I am others. If someone can trace their ancestry back to 17th century New England, it is very likely one can find similar relatives to the ones I listed. Maybe not the same ones, but similar ones. A couple weeks ago I had the opportunity to visit the National Personnel Records Center, and retrieved some "Auxiliary records" for a handful of of kin who served in the Army. A fire in 1973 destroyed most of the Personnel Folders for those discharged between 1912 and 1960, but before making my visit I contacted the center, and the staff was able to inform me whether any records existed for each of the individuals. All the folders were destroyed, but there were a handful of other records that they had on location. So when I showed up, they had these records waiting for me. It felt a little like I was a celebrity on Who Do You Think You Are. One of these records was the Hospital Admission Record for my great-uncle, Mandell Newmark, who died in the Philippines in April of 1945. YEARS OF SVC: 6 2-3 yr.
OPERATION: 302 Fracture, compound, closed, treatment of, w/splints/casts; or Fracture w/bone fragment removal and cast. Source: This information was obtained from the Hospital Admission Card data files (1942-1945; 1950-1954), created by the Office of the Surgeon General, Department of the Army. During 1988, this secondary source material was made available to the National Personnel Records Center by the National Research Council, a current custodian of the data file. The file was originally compiled for statistical purposes, therefore, name identification does not exist and sampling techniques were used with the result that not all hospital admissions are included. 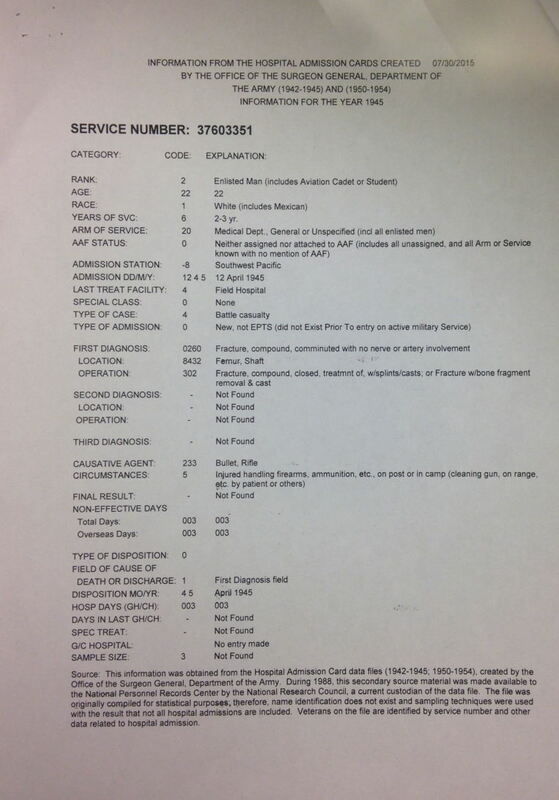 Veterans on the file are identified by service number and other data related to hospital admission. 1) The first thing to note is that this isn't an original record. It is a printout derived from the Hospital Admission Cards, and was created in July of this year (by the Personnel Records Center in preparation for my visit.) I don't have an image of the Hospital Admission Card, but I am confident the only information on it is the codes. The accuracy of the explanations is dependent upon the use of the correct decoding system. We can assume that the National Archives would use the correct decoding system, correct? No. They've made mistakes in the past. Ten years ago, the National Archives discovered they had been using the wrong code book for the Civilian Occupation Codes. This meant the occupation on all the Army Enlistment records was incorrect. NARA updated their records in 2005. Ancestry updated their records sometime between 2007 (when I first looked up the records for several kin) and 2011 (when I noticed the change, and wrote about it). The description of the circumstances of injury matches what the family was told. Mandell was shot by a fellow soldier who was cleaning his rifle. 2) The record indicates he was shot on April 12, and remained alive for three days. His obituary also stated that he died three days after his wounds. Obituaries are a wonderful resource, but when one's library research time is restricted one focuses on documents where one expects to find new information. That new information can sometimes lurk in unexpected places. I have a cousin who has researched the Cruvant lines for several decades, and I have a rather extensive database covering the Cruvant/Kruvant/Cruvand/Kruvand descendants and cousins of my second great grandparents. But being completist, I knew I should look up her obituary, even though I knew there wouldn't be any surprises. CRUVANT - On Wednesday, Feb 13, 1924, Minnie Cruvant, widow of Morris Cruvant, fond mother of Mrs. Bertha Newmark, Mrs. Stella Stern, Mrs. Flora Altman, Benjamin, David and Sol Cruvant. Dear sister of Mrs. Blanche Rubin, and our dear grandmother. Funeral from Berger Chapel, 4715 Mcpherson avenue on Friday Feb 15 at 10 a.m.
Reading the obituary, I was stunned. Minnie had a sister? Siblings of immigrant ancestors have been the source of several surprises during my years of research. When one can trace their lines back several generations on American soil, the US Census will usually record most siblings. There is the 20 year gap between 1880 and 1900, due to the destruction of the 1890 census, but otherwise it is difficult for someone to be born, grow up, and leave the household in the usual 10-year census gaps. However, since I don't have access to pre-immigration records, siblings or adult children of immigrants can escape notice. When an obituary doesn't indicate where a relative lives, that often means they live in town. So I looked up Blanche Rubin in the Online Missouri Death Certificates. Her death certificate lists her parents as Mendel Majabovsky and Sarah Greenberg. Minnie's parents are thought to be Mendel and Sarah Goldstein. It's possibly the same mother, with at least one improperly recorded maiden name. However, the dates of birth for the two sisters are twenty years apart, Minnie being the elder, suggesting they are actually half-sisters. In 1920, Blanche and her husband, Ben Rubin were living next door to Philip and Leah Rubin. Philip and Leah's daughter, Anna, would marry David Cruvant, the son of Morris and Minnie. Were Ben and Philip related? It seems a strong possibility. However, complete strangers live next door to one another all the time, and it is possible for them to share a surname. Ben and Blanche's nephew marrying Philip and Leah's daughter isn't proof of anything. I've now looked up the death certificates and obituaries for Ben and Phil without confirmation one way or another. I've managed to trace two children of Ben and Blanche who each had one child, and these two grandchildren are still living. I will likely write to them to see if they can provide further information. However, I'm glad I finally found the time to look up the obituary for my second great grandmother. PINE LAWN – Robert Gober, 75, died at his home last Friday. He was born in Vanduser and farmed in the Sikeston area until he moved to the St. Louis area 17 years ago. He is survived by his wife, the former Mabel Fulkerson, and one daughter, Anna Lee Wallace, of St. Louis. Those from Sikeston attending services in St. Louis Monday were Mr. and Mrs. Ellis Alcorn, Mr. and Mrs. C.D. Alcorn, Mr. and Mrs. Dale Alcorn, Mrs. And Mrs. Lester McDonald and one daughter Tammy. Gober’s wife is a sister of Mrs. Ellis Alcorn. 1) I transcribed his WWI registration form a few weeks ago. 2) Mrs. Ellis Alcorn was Urista Fulkerson, a sister of Mabel (Fulkerson) Gober. I believe the three children of Urista and Ellis who attended the services were Cal, Dale and Blanche. 3) In addition to the familial relationships, the obituary provides an estimate for the year the Gobers moved to St. Louis - 1954.